HOLYOKE — A few years ago, Julia Levesque didn’t think she would graduate high school. But on Friday, she was dressed in a black cap and gown along with nine other students who completed their high school studies through an alternative learning program. 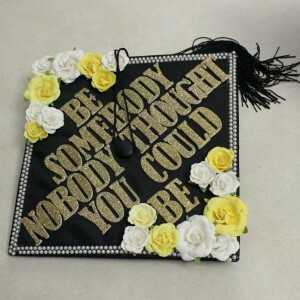 “Be somebody nobody thought you could be,” her cap read in gold letters that shimmered in the light. The cap was bordered with craft pearls and the corners had faux roses in yellow and white. At East Longmeadow High School, Levesque was failing her classes and there was no hope of graduating. The social factors were demanding and made it hard to concentrate on schoolwork. “It was hard to be yourself,” Levesque said. But then Levesque enrolled at Mount Tom Academy, an alternative learning program run by the Collaborative for Educational Services in Northampton, and her outlook changed. Now Levesque plans on attending Holyoke Community College for two years and transferring to Westfield State University to pursue a degree in early education. Since she was 5 or 6, Levesque said she’s had the dream to become a kindergarten teacher. Since 1999, the academy has served high school students who have been unsuccessful in a traditional school setting and are at risk of failing or dropping out. The collaborative partners with HCC, and students learn at their own pace in a small, one-classroom environment at the college. On Friday, Northampton City Council President Bill Dwight was the keynote speaker at the ceremony. He didn’t finish high school and received his GED in September 2012. But he said he has lived with the shame of being a bad student for a long time. He told the students that their diploma carries a special significance. On one hand, it certifies completion of high school by state standards, and on the other hand it represents the struggles and the emotions each student’s journey holds. District schools such as Hampshire Regional High School, Belchertown High School and South Hadley High School recommend Mount Tom to students who may be more successful in an alternative learning environment. Some students return to their district schools and some finish their work at Mount Tom and earn their diploma from their district school.